Although we often think of fungi as organisms that cause disease and rot food, fungi are important to human life on many levels. As we have seen, they influence the well-being of human populations on a large scale because they are part of the nutrient cycle in ecosystems. They have other ecosystem roles as well. As animal pathogens, fungi help to control the population of damaging pests. These fungi are very specific to the insects they attack, and do not infect animals or plants. Fungi are currently under investigation as potential microbial insecticides, with several already on the market. 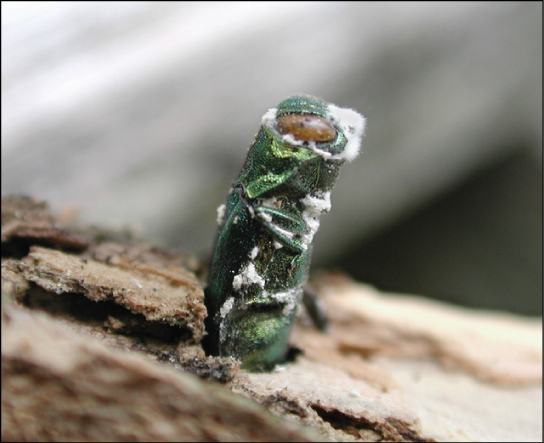 For example, the fungus Beauveria bassiana is a pesticide being tested as a possible biological control agent for the recent spread of emerald ash borer. It has been released in Michigan, Illinois, Indiana, Ohio, West Virginia and Maryland ([link]). The mycorrhizal relationship between fungi and plant roots is essential for the productivity of farm land. Without the fungal partner in root systems, 80–90 percent of trees and grasses would not survive. Mycorrhizal fungal inoculants are available as soil amendments from gardening supply stores and are promoted by supporters of organic agriculture. We also eat some types of fungi. Mushrooms figure prominently in the human diet. 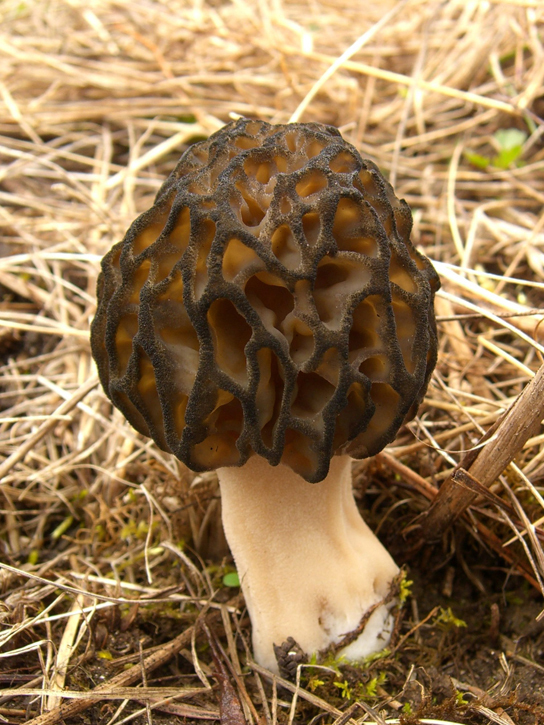 Morels, shiitake mushrooms, chanterelles, and truffles are considered delicacies ([link]). The humble meadow mushroom, Agaricus campestris, appears in many dishes. Molds of the genus Penicillium ripen many cheeses. They originate in the natural environment such as the caves of Roquefort, France, where wheels of sheep milk cheese are stacked in order to capture the molds responsible for the blue veins and pungent taste of the cheese. Fermentation—of grains to produce beer, and of fruits to produce wine—is an ancient art that humans in most cultures have practiced for millennia. Wild yeasts are acquired from the environment and used to ferment sugars into CO2 and ethyl alcohol under anaerobic conditions. It is now possible to purchase isolated strains of wild yeasts from different wine-making regions. Louis Pasteur was instrumental in developing a reliable strain of brewer’s yeast, Saccharomyces cerevisiae, for the French brewing industry in the late 1850s. This was one of the first examples of biotechnology patenting. Many secondary metabolites of fungi are of great commercial importance. Antibiotics are naturally produced by fungi to kill or inhibit the growth of bacteria, limiting their competition in the natural environment. Important antibiotics, such as penicillin and the cephalosporins, are isolated from fungi. Valuable drugs isolated from fungi include the immunosuppressant drug cyclosporine (which reduces the risk of rejection after organ transplant), the precursors of steroid hormones, and ergot alkaloids used to stop bleeding. Psilocybin is a compound found in fungi such as Psilocybe semilanceata and Gymnopilus junonius, which have been used for their hallucinogenic properties by various cultures for thousands of years. As simple eukaryotic organisms, fungi are important model research organisms. Many advances in modern genetics were achieved by the use of the red bread mold Neurospora crassa. Additionally, many important genes originally discovered in S. cerevisiae served as a starting point in discovering analogous human genes. As a eukaryotic organism, the yeast cell produces and modifies proteins in a manner similar to human cells, as opposed to the bacterium Escherichia coli, which lacks the internal membrane structures and enzymes to tag proteins for export. This makes yeast a much better organism for use in recombinant DNA technology experiments. Like bacteria, yeasts grow easily in culture, have a short generation time, and are amenable to genetic modification. Fungi are important to everyday human life. Fungi are important decomposers in most ecosystems. Mycorrhizal fungi are essential for the growth of most plants. Fungi, as food, play a role in human nutrition in the form of mushrooms, and also as agents of fermentation in the production of bread, cheeses, alcoholic beverages, and numerous other food preparations. Secondary metabolites of fungi are used as medicines, such as antibiotics and anticoagulants. Fungi are model organisms for the study of eukaryotic genetics and metabolism. Historically, artisanal breads were produced by capturing wild yeasts from the air. Prior to the development of modern yeast strains, the production of artisanal breads was long and laborious because many batches of dough ended up being discarded. Can you explain this fact? The dough is often contaminated by toxic spores that float in the air. It was one of Louis Pasteur’s achievements to purify reliable strains of baker’s yeast to produce bread consistently. Importance of Fungi in Human Life by OpenStaxCollege is licensed under a Creative Commons Attribution 4.0 International License, except where otherwise noted.